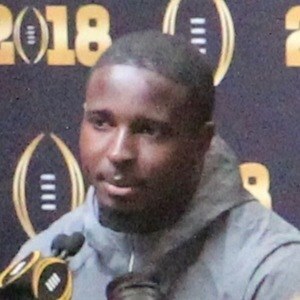 Running back who helped the University of Georgia win an SEC Championship and reach the National Championship game in 2017-18. He was selected 31st overall in the 2018 NFL Draft by the New England Patriots and helped the team win Super Bowl LIII in 2019. He attended American Heritage High School in Plantation, Florida. He played football but also competed in track and field events. He was rated by Rivals.com as a five-star recruit. He then committed to the University of Georgia to play college football. Rivals.com ranked him as the third best running back and 13th best player overall in the 2012 and 2013 season. His parents emigrated from Haiti a year after his sister, Lamise, was born. He was born and raised in Orlando, Florida. He was teammates with fellow running back Nick Chubb at Georgia.